With the exception of sleep, humans spend more of their lifetimes on work than any other activity. It is central to our economy, society, and the family. It underpins our finances and our sense of meaning in life. Given its overriding importance, we need to recognize a profound transformation in the nature of work that is significantly altering lives: the incoming tidal wave of shadow work. Shadow work includes all of the unpaid tasks we do on behalf of businesses and organizations. It has slipped into our routines stealthily; most of us do not realize how much of it we are already doing, even as we pump our own gas, scan and bag our own groceries, execute our own stock trades, and build our own unassembled furniture. But its presence is unmistakable, and its effects far-reaching. 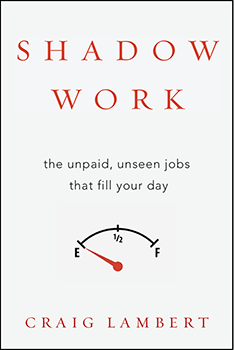 Fueled by the twin forces of technology and skyrocketing personnel costs, shadow work now pervades our society. Lambert describes its fallout as “middle-class serfdom,” and examines its sources in the invasion of robotics, the democratization of expertise, and the “information dragnet” that now surrounds us. The end result? A more personalized form of consumption, a great social leveling (pedigrees don’t help with shadow work), and the weakening of communities as robotics replaces daily human interaction. Shadow Work offers a field guide to this new phenomenon. It shines a light on these powerful trends and, more importantly, offers valuable insight into how to counter their effects. Its explanation of why leisure time is disappearing will be essential reading for anyone seeking to understand how their day got so full—and how to deal with the ubiquitous shadow work that permeates our lives.